Single accommodations are available on this tour. Ask about special pricing. Whether you’ve yet to discover the magic of Ireland or are returning to the country you’ve fallen in love with, this CIE Tours guided vacation is the gold standard of Irish tours. Start in Dublin with a Welcome Drink and tour of the capital city. See the Celtic crosses on the banks of the River Shannon and the constantly-changing granite hills and sparkling lakes of Connemara. Take a horse-drawn jaunting car ride through Killarney National Park to scenic Ross Castle and ride through Ireland’s most scenic byway, the Ring of Kerry. View the mighty Cliffs of Mohrer rising almost 700 feet above the Atlantic Ocean and kiss the famous “Stone of Eloquence” at Blarney Castle. Spend a fun evening at a pub dinner with traditional entertainment in Killarney and your last evening dining on superb cuisine at a popular Dublin restaurant, O’Connell’s. CIE Tours has 85 years of experience providing travelers with the highest quality of vacations to Ireland and Britain. CIE motorcoach tours are fully inclusive with no optional extras to purchase at your destination. Your guided vacation begins at 2 p.m. at your hotel. Head out for an introductory tour of Dublin, including O’Connell Street, St. Stephen’s Green, the seat of government at Leinster House and other public buildings. Take a stroll through Trinity College’s campus in the center of the city with a student guide and view the priceless 8th century Book of Kells, an illuminated manuscript of the four Gospels. Enjoy a Welcome Drink with your group, followed by an independent evening at one of Dublin’s many restaurants or pubs. Journey across the rolling pastures of Ireland’s heartland to visit Clonmacnoise. This monastic settlement was founded in 545 A.D. and is set on the banks of the mighty River Shannon. See elaborate high Celtic crosses decorated with biblical scenes. Head to Galway and enjoy a guided walking tour through the city center. Enjoy free time to explore Galway on your own before dinner. Today explore scenic Connemara to admire how constantly-changing cloud formations give granite hills, sparkling lakes and peat bogs an added dimension. Head to Kylemore Abbey to tour elegant rooms and the charming church set beside a tranquil lake. Return to Galway where the evening is free to explore the city. Travel south around Galway Bay and through the Burren, a region of rounded limestone hills which has a curious lunar-like appearance. Immerse yourself in farm life and watch trained sheepdogs obey their owner as they direct sheep through various obstacles. View the Cliffs of Moher, which rise almost 700 feet above the pounding Atlantic surf. Embark on a memorable ferry across the River Shannon Estuary and head to a cozy pub in Killarney for an Irish night featuring a lively show with dinner. Take a horse-drawn jaunting car through the Killarney National Park to scenic Ross Castle, set on the shores of Lough Leane. Head to Muckross House for a guided tour and a stroll through the gardens. Set out on Ireland’s most popular scenic drive—the Ring of Kerry—with plenty of stops for photos. Savor a light lunch and take a break in the colorful village of Sneem. Cross to Valentia Island by bridge and tour the Skellig Experience, which explains the life of early Christian monks on Skellig Michael, a rocky offshore island that was featured in the “Star Wars VII” movie. Return to Killarney for an evening on your own. Drive through the mountains into rich farming country on the way to Blarney Castle. Kiss the famous “Stone of Eloquence” or explore the tranquil gardens. Treat yourself to quality Irish-made goods at Blarney Woollen Mills before traveling along the coast to the Marine Bar in Dungarvan for a creamy Irish coffee and traditional music. Continue to Waterford to witness the creation of crystal masterpieces during your visit to the House of Waterford Crystal. This morning join a Local Guide for a walking tour through the narrow streets of the old city to discover Waterford’s long history and some of its colorful characters. Visit the nearby Medieval Museum, a modern building which incorporates a 13th-century Choristers’ Hall and the 15th-century Mayor’s Wine Vault. Stop in Kilkenny for a look around the compact city center and have lunch on your own. Travel to Dublin and in the evening and head to the popular O’Connell’s Restaurant for a Farewell Dinner of superb cuisine. Enjoy an independent Hop-on, Hop-off bus tour and a visit to one of Dublin’s top attractions, like the Guinness Storehouse, Teeling Distillery, EPIC Ireland or the General Post Office Museum. Call 800.459.1597 to Book Your Irish Gold Guided Tour Today! 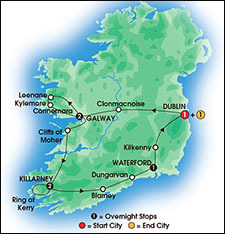 Price is per person based on double occupancy and includes accommodations; 13 meals; on-tour motorcoach transportation; ferry ride across the River Shannon Estuary; guided sightseeing; catamaran cruise on the Killary Harbour; baggage handling on tour (one bag per person); local taxes and service charges. Prices and travel dates vary by tour. See complete Terms and Conditions. Price is per person based on double occupancy and includes accommodations; 13 meals; on-tour motorcoach transportation; ferry ride across the River Shannon Estuary; guided sightseeing; catamaran cruise on the Killary Harbour; baggage handling on tour (one bag per person); local taxes and service charges. Prices and availability are subject to change without notice. Fares shown are in U.S. dollars for new reservations only and are subject to availability. Please call us at 800.864.7084 for more information. This offer may not be combined with any other offer/promotion and may be withdrawn at any time. Airfare, car rental, optional tours and attraction tickets, and items of a personal nature are not included. Great Vacation Destinations, Inc., doing business as Bluegreen Travel Services, is located at 12400 S. International Drive, Orlando, FL 32821. Great Vacation Destinations, Inc. is registered with the State of California as a Seller of travel Reg. No. 2068362-50 (registration as a seller of travel does not constitute approval by the State of California); Washington Seller of travel Reg. No. 602-283-711; and registered with the Airlines Reporting Corporation (“ARC”) number 15-72225-4. In the event of a conflict between CEI Tours’ Details of Participation and Great Vacation Destinations Details of Participation, CIE Tours’ Details of Participation will govern.